Like most of you, I have quite a few plants in my atrium I have no idea what they might be. I'm working today to try to identify a few. The plant on the page at the link below is one of my "mystery" plants. 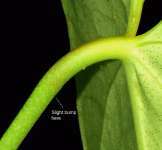 Although it appears to be an Anthurium, look closely at the leaf blade and the petiole. There is no collective vein on the leaf and no geniculum on the petiole. That elimates an Anthurium species. The leaf is very thick and coriacious but I have no idea what the species or genus may be. The leaf measures 25.4cm (10 inches). I often have people send me specimens in hopes I can figure out what they may be and I believe this one came last summer. I put it on a shelf and never paid much attention to it until today so I don't even know who to tell what it is since the tag is lost! If you have an ID, please let me know. the characters are not well developed. > working today to try to identify a few. > genus may be. The leaf measures 25.4cm (10 inches). > lost! If you have an ID, please let me know. This plant on your photo looks like a common A. andreanum. Leland, although I can't see a geniculum if I run my fingers up the petioles I can feel a very faint bump about an inch from the top. I am assuming that is what you are seeing. As for the collective vein, I can see one beginning from one lateral vein from the sinus that circumvents the lower portion of the blade but not the entire blade. I was looking for a collective vein that totally circles the blade. If you found the tag, I'd really like to know! include the back or posterior lobes. This plant resembles Anthurium longipeltatum (Matuda). the characters that your photo reveals. Thanks again Leland. I'll check TROPICOS. Although not posted yet, I had just asked if the collective vein necessarily had to circle the leaf, your explanation solves that! I always appreciate the input and your personal assistance. does start where you indicate on your plant's petiole. bloomed and the inflorescence was erectly held. > input and your personal assistance. > include the back or posterior lobes. > the characters that your photo reveals. I'll check into your observations but Leland's suggestion it is Anthurium longipeltatum appears to fit. Leland, your observations are always so insightful and accurate! I too had noticed the punctates this morning when examine the plant with a magnifying glass. Since I didn't have any idea what species to be checking against that was only additional information at the time. But this afternoon I got a copy of Dr. Croat's treatment of Anthurium longipeltatum Matuda and it is on my reading list for tomorrow morning. It strongly appears you have figured out the species of this plant. I am hopeful the Anthurium (which I had thought was not an Anthurium) will produce an inflorescence later in the year and I'll be able to verify your observations more fully. This one caused me to learn some very new premises regarding Anthurium species. First, the collective vein does not have to completely traverse the leaf, and second, the geniculum can be barely noticeable and still be present. Just for the record, I want to let everyone know how thankful I am to have guys like you and Julius around! Dr. Croat helps me all the time but he's out of the office this week so you guys are very valuable to me, and to this forum in general! Thanks for your help and I'll be reading Dr. Croat's entire treatment tomorrow in an effort to compare more features on the plant. Thanks again to everyone who responded!